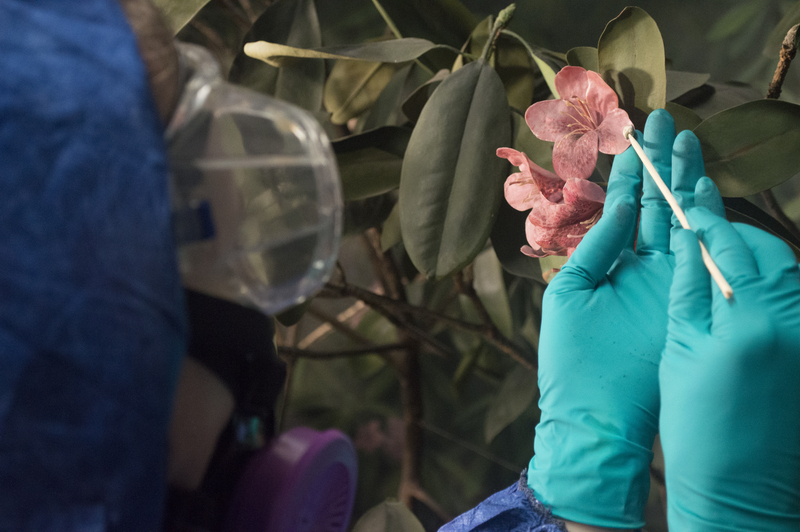 In the winter, spring and summer of 2018, Academy staff and outside conservators and artists cleaned and renovated every inch of our Takin and Gorilla wildlife scenes. They installed new lighting, repaired cracked backgrounds, removed layers of dust, propped drooping tree branches, replaced curled leaves and generally restored life to these nearly century-old snapshots in time. 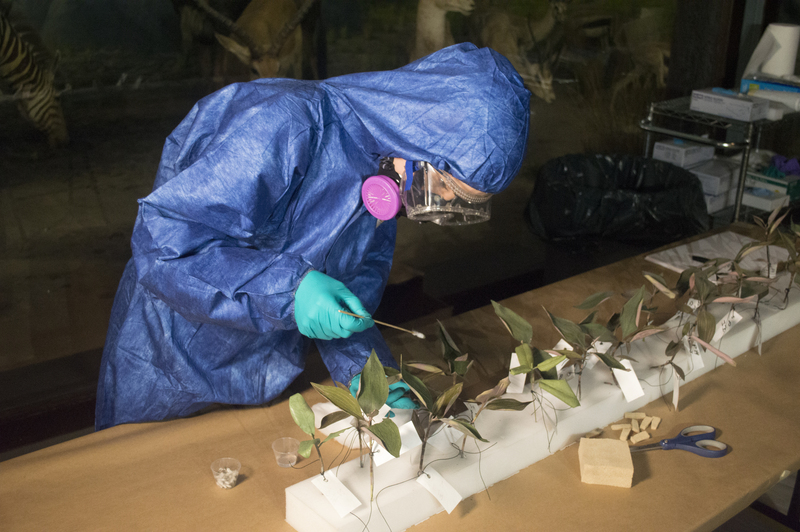 Academy Exhibition Designer Lauren Duguid spent most of her summer cleaning plant models inside the dioramas. We spoke with her below about the artistry of diorama renovation, her role in the project and what it was actually like to work inside a physical time capsule. 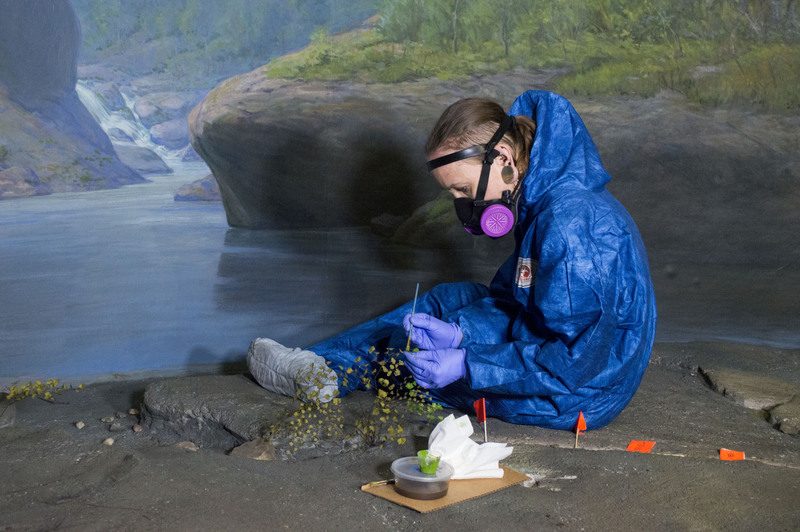 ANS: What kind of training qualifies someone to support the renovation of historic dioramas? LD: We’re working with a team of specialists who have years of experience working with these materials. I can’t speak to the training required to work with the taxidermy or any elements we didn’t encounter during this project, but I can describe the training I received for my role. 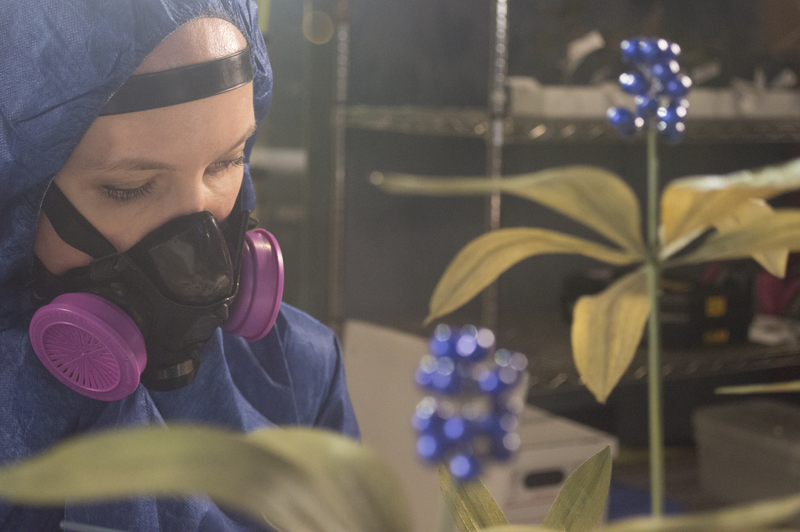 To clean the plant models, I’m following the guidance of art conservators. 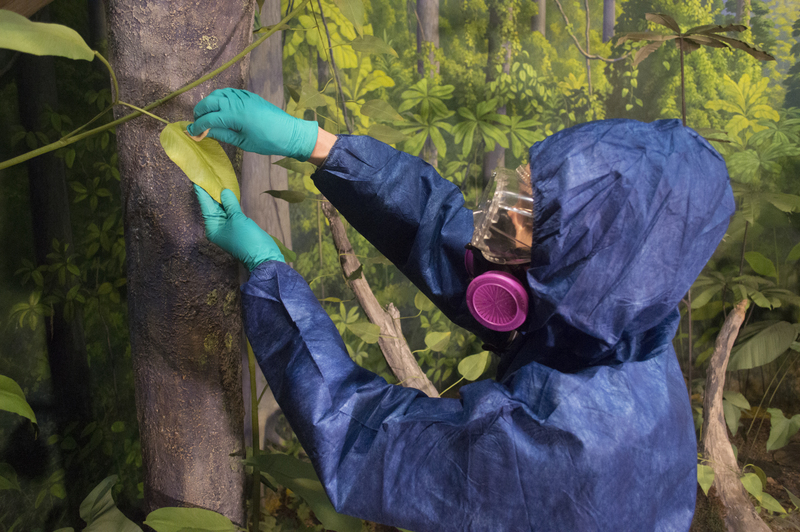 They carefully tested each plant model to determine what it was made of and what would be the safest way to clean it. The trick is to remove the dirt without removing any pigment. Then, they showed me the cleaning techniques and how to do basic repairs on damaged models. The guidance I received from them was critical. I also have academic training in fine arts, which helped quite a bit. ANS: What is your academic and career background? LD: I have an undergraduate degree in Illustration and a master’s degree in Museum Exhibition Planning and Design. Since starting in the museum field, I’ve had the fortune of working as an exhibition designer at the Penn Museum and here at the Academy of Natural Sciences. After hours, I teach a graduate level computer-aided design course in the Museum Studies department at The University of the Arts. Occasionally, I’ll take on a freelance graphic design project. ANS: What has your role been in the diorama renovation process? LD: Most of my time has been spent cleaning (it’s a slow process), but I’ve had a menagerie of roles inside and outside the dioramas. At the outset, I worked with our botanist who researched these two expeditions. Together, we created keyed diagrams of the dioramas with codes for all the models and identifications for the species depicted. I worked with our scientists and a model making company to order the new butterfly and the new orchids. I helped design the work rooms for each space. I surveyed and drafted the dioramas so the team could plan the platforming system. I’m also involved with the physical design of the new interpretive panel and digital kiosk. Inside the dioramas, I cleaned every plant I could safely reach (including the branches and real leaves in the leaf litter), repaired damage, dusted a background mural, washed rocks, rewired broken and sagging branches, collected new region-specific leaf litter, vacuumed the tree trunks and repainted certain plants. ANS: Have you ever done anything like this before? LD: The planning and design work, yes, but inside the diorama? No, not to this extent. The closest I’ve come is briefly working with the skunks and opossums in North American Hall. I’d say the most familiar tasks were painting and working with wax. Having sculpted with wax came in handy when repairing the rhododendron flowers. Everything else was new to me. It’s been a tremendous learning experience. ANS: What changes in the diorama will be most noticeable to our visitors? LD: Without a doubt, visitors will notice the taxidermy restoration right away. 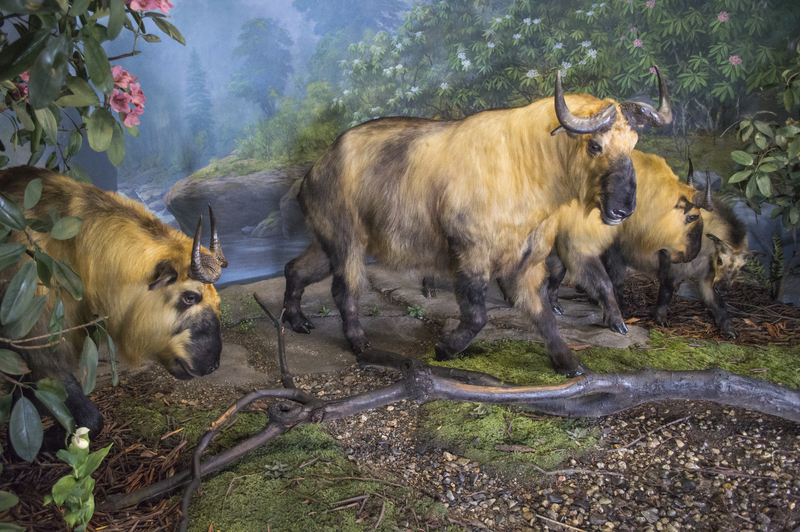 When I visited Wildlife Preservations [the consultants supporting the diorama renovation] to see the color tests on the takin, it looked like the difference between faded grayscale and full color. The progress photos of the gorilla were breathtaking. The biggest changes in the environments will be the repainted moss in the takin diorama and the new butterfly and snails in the gorilla diorama. If visitors compare the before and after images, they’ll notice how much more lush the spaces look overall. With the new lighting and that haze of dust cleared away, the scenes feel more alive. ANS: What are you most proud of? LD: I think I’m most proud of the paint job on the marble berries. 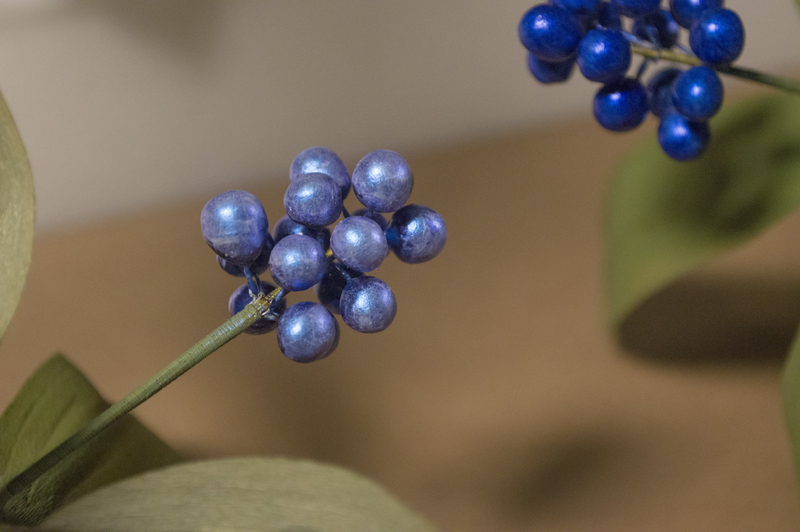 The original color on the berries was a dull blue that looked far too dark in the scene. The models didn’t stand out, and they should have. I repainted each berry with interference paint, stained it with indigo and then covered it with a thick gloss coat. Now, the color feels electric. They’re tiny superstars in that scene. ANS: So, what’s it been like—really—working in that Tyvek suit? LD: Hot! Very hot. It’s demanding work. Tyvek is great at protecting people from hazardous materials, and I’m grateful for that. It doesn’t breathe, though, so it traps body heat. I’m usually soaked through with sweat in less than an hour. It’s also bulky, which makes it tough to be nimble around delicate plant models. I have new depths of appreciation for first responders and anyone else who works in protective gear. ANS: What surprised you most in this project? LD: I was surprised to learn about synthetic saliva. It’s amazing enough that it exists, but it also proved to be the best cleaning agent for the rhododendron leaves. Everything else we tried either failed to remove the dirt or stripped the leaves of pigment. Synthetic saliva saved the day. Read more about the diorama renovation from start to finish.